You could be forgiven for wondering how a clutch of cards with pictures on could help anyone with their love-life. Surely it isn't possible for someone to pull out tarot cards at random and expect any meaningful information to be delivered? It does seem somewhat unlikely, but I have a theory... well, I have several theories about how and why tarot works. But this is the simplest: every card in the tarot can reveal insights about a person. Therefore, it doesn't matter which cards show up – any and all can give you valuable information. Another idea is that the truths portrayed in tarot are applicable to everyone's life ,and somehow, between intuition, psychic vibration and the collective unconscious, the pertinent cards always show up for the situation under consideration. As a professional tarot reader for many years, I would say that two thirds of my readings are about relationship issues. We have relationships with every single person in our lives, whether that be close family or someone you chat to on Facebook. In modern life, relationships are how we define ourselves; without other people to reflect back to us, most of us would find it difficult to function. So it is no surprise, then, that so many people have concerns and questions about relationships. Here's the message I tried to impart to my clients – it's always about you. The most important relationship anyone will ever have is with themselves. Get that bit right first, and romantic love and healthy relationships with others will follow, as sure as night follows day. 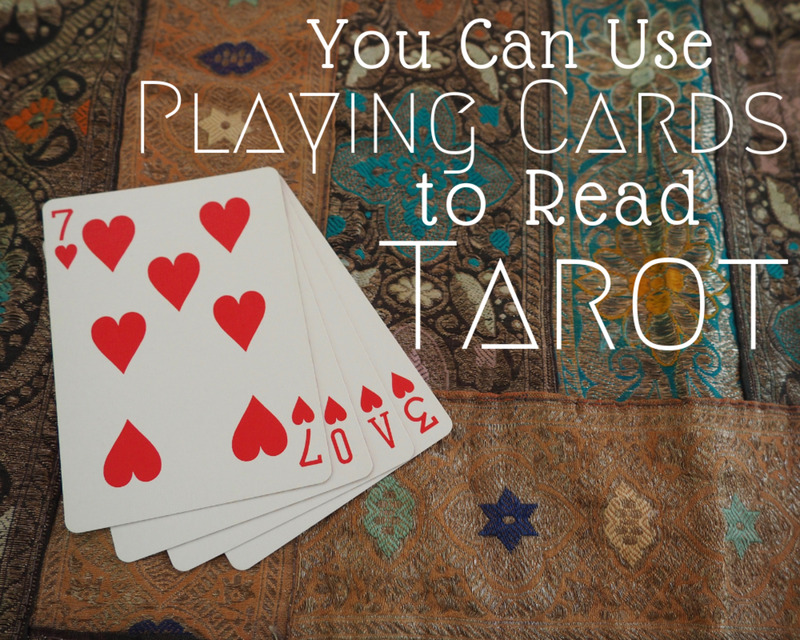 Let's examine how using tarot cards can help with that. Without going into too much depth, I have a view that each person has two aspects—the physical human who is reading this right now and a spiritual, non-physical being who is your true self. You are, of course, already your true self, but when you die, you revert back into your non-physical self. When we feel joy, these two aspects are together and aligned but when we are facing struggle or are unhappy, then the two selves are far apart. Your spiritual being never feels discord, anger, hatred, despair or disappointment, so when you, in your human form, feel bad, it is because the gap between your current standpoint and your spiritual self is so wide you cannot be in alignment with who you really are. When you are aligned you are irresistible to others. They are attracted to you and they don't always know why. You know people like this—they are great to be with and you always feel good after spending time with them. Before bringing anyone else into the equation, I suggest you do a reading (or have one done for you) to show where you are in relation to your spiritual or 'higher' self. You need two points of reference so two cards will be sufficient. I drew two cards for an imaginary client (I'll call her Anne). The first card represents where she is right now and the second is where her higher self resides. The aim of this reading is to show how the gap can be closed. 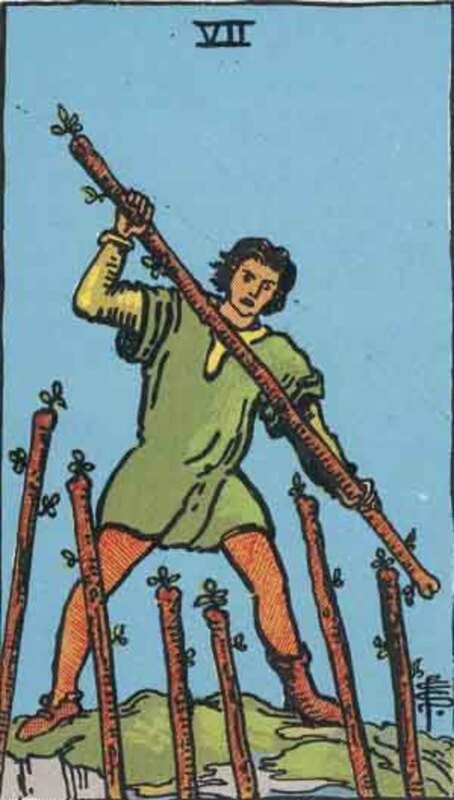 The Seven of Wands shows a person in a position of defense. He or she, let's assume 'she' as my mythical client is female, appears to be fighting off six unseen adversaries. Although she is outnumbered, she does have the advantage of the higher ground. You'll also notice she is wearing mismatched shoes. This is a very action-based card indicating that Anne is feeling that life is a bit of a struggle right now. She's off-balance, and also feels completely unsupported. As far as relationships go, if she is in one, then that lack of support is a big issue. If she is not in a relationship, then she could be feeling that there is simply too much competition and she would be better off backing off. You can see that with this outlook, Anne is far away from her spiritual self and not only that, she would not be in the right frame of mind to nurture an existing relationship or attract a new one. 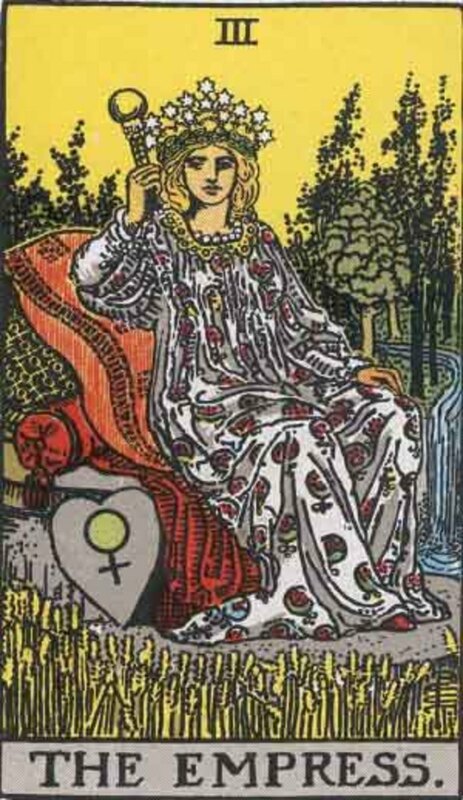 The Empress is a Major Arcana and, therefore, has a very strong influence. That makes sense, given the context of the reading. This card represents Anne's true spiritual nature. The Empress sits peacefully in a field of corn, surrounded by cushions, blankets and symbols of abundance and fertility. She is very comfortable as can be seen by her relaxed posture. 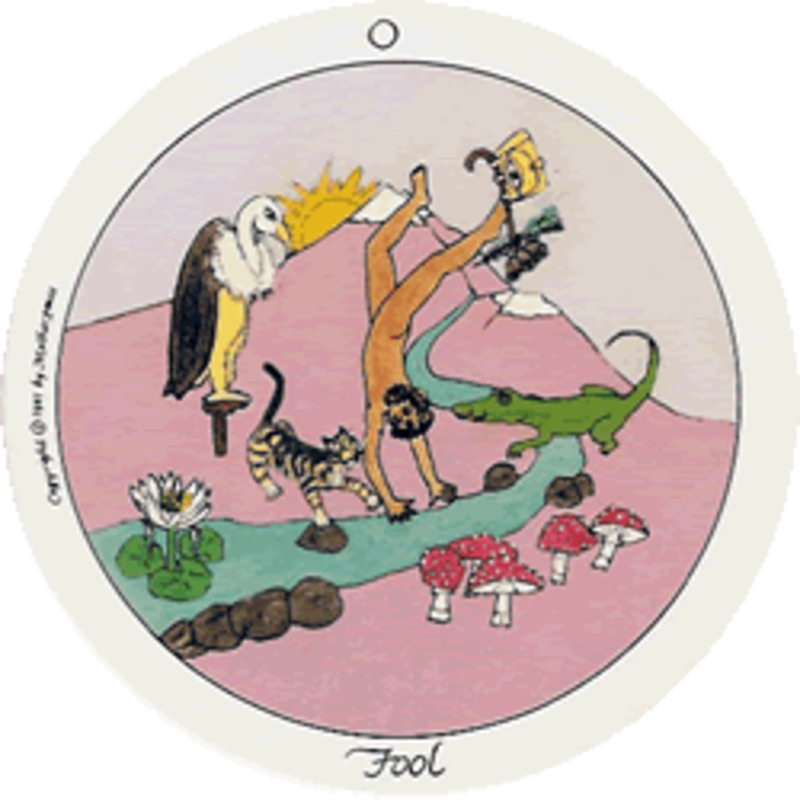 It is easy to see that there is a very wide chasm between the stressed out figure on the Seven of Pentacles and the relaxed easy-going Empress. The message to Anne from the Empress is that she needs to stop struggling, stop looking for support from others and simply relax and find ways to enjoy herself. Once she drops the fight, others will stop pushing against her. If she takes on some of the characteristics of the Empress card, life will improve dramatically. Additionally, the Empress is very much connected with sexuality, so if Anne will relax, her current relationship will improve and she will be very attractive to potential lovers. This is, of course, a very incomplete and short overview, but you can see how it works. What do I need to understand about my relationship? What action can I take to improve matters? What do I need to change to make things better? It's always a good idea to start with the “Your Relationship with You” reading as that will give you a solid platform from which to explore the options available to the person asking the questions. Let's pretend that Anne is married but lately she and her husband have drifted apart. The attraction that held them together has faded and the marriage is based on habit and routine rather than romantic love. Ann knows deep down she loves her husband and she is sure he loves her but it has all become mundane and so boring that she thinks her only choice is to leave or have an affair. I'll draw one card for her, asking what she could do to change her attitude towards her husband. Six of Pentacles. Copyright-free Rider Waite, Pamela A version. 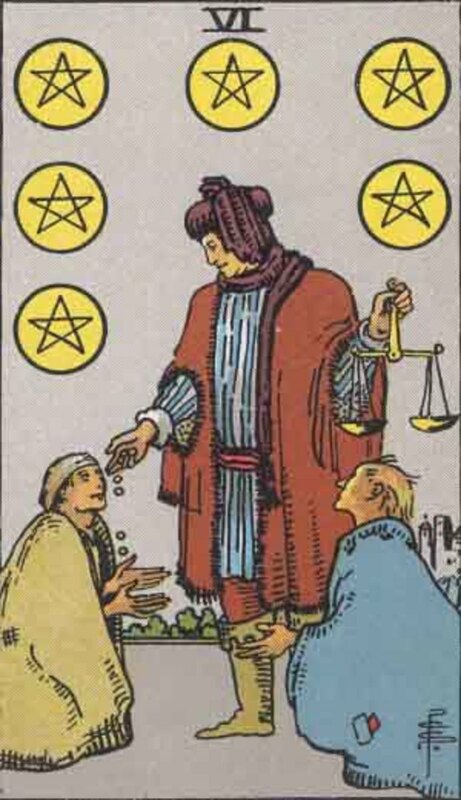 The Six of Pentacles depicts a rich merchant handing out gold coins to beggars. He holds a scale in his left hand indicating that he has carefully weighed out the gold before handing it over. How might the Six of Pentacles advise Anne to change her attitude towards her husband? Before going any further I would ask Ann whether she identifies herself with the merchant or with one of the beggars. Her answer will provide the basis for the correct advice. If she says she is the merchant because she is the one that gives in the relationship – she is the supportive one, the one who offers help, the one who holds the marriage together, then she needs to examine her feelings in detail. Does she feel resentment? Does she ration her affection? If so, then at this point I may suggest some professional counselling may be worth considering. If she says she identifies with the beggar receiving the coins, then money may certainly be an issue. Perhaps Anne thinks her husband is mean with money? Gentle questioning may uncover the fact that her husband is careful rather than mean. Or that he feels responsible for not only his immediate family but perhaps other members of the family too. Perhaps Anne would feel better if she made a financial contribution to the family coffers? Maybe Anne has identified herself with the beggar who is not receiving the coins. This would indicate that she has low self-esteem and may be suffering from anxiety and a feeling of unworthiness. From here, it is a logical step to go back to “Your Relationship with You” in order to help Ann understand that for her relationship to change, she has to change herself first. One card will probably not be sufficient to give Anne the answers she needs, but you can see how much can be revealed by one single tarot card. If you can get your client to really look at the card and start talking about it, many layers will be uncovered. This exercise should be treated as a fun game and not to be taken seriously. Get strong piece of card and on it write a list of ideal attributes and characteristics you would like in a potential partner. Be as specific as you like. You might want him to be a certain height and to love children. You might want him to be wealthy and to enjoy socializing. Write it all down. You could add a magazine photo too but be careful with this. I read somewhere that a woman created a vision board and included a good looking man who was holding a crystal glass of champagne. She did meet a devastatingly handsome chap whom she fell head over heels in love with. Unfortunately he was an alcoholic. Now go through your tarot cards and look for those that represent some of the qualities you wrote down. You don't need to use more than six cards. Place them face-up on the piece of card. You might weigh them down with some rose quartz. Put the piece of card in a safe place and light a small candle nearby. Let the candle burn down while you contemplate the man of your dreams. Once the candle has burned out, place your piece of card into a drawer or on a shelf. Leave the tarot cards on it. Within a month your man should turn up in your life. Well... you never know! I have studied tarot since 2000, honing my skills on The Free Reading Network (American Tarot Association) and for World Tarot Readers. I was one of the founding members of TABI (Tarot Association of the British Isles) and helped develop and teach TABI's foundation course, as well as contributing to the newsletter. 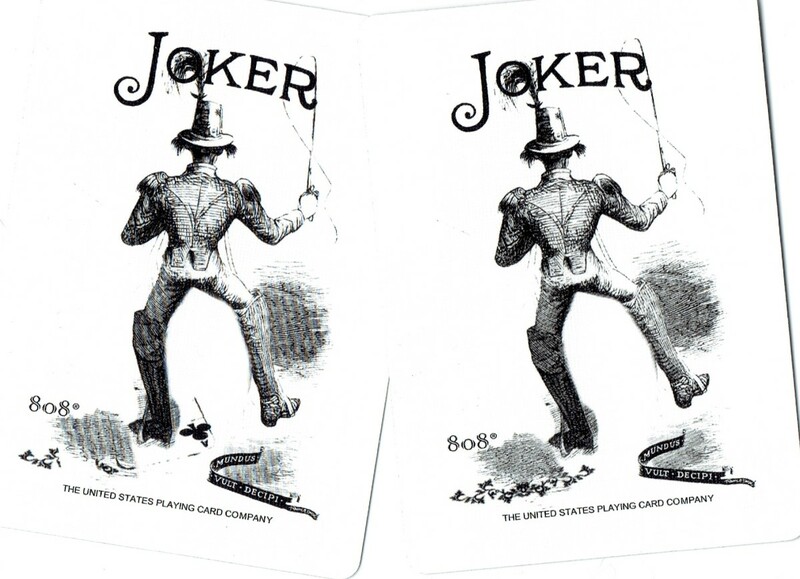 Please note: all images on this page are from the copyright-free Rider-Waite deck. Pamela A version. They can be found in their entirety at SacredTexts. Do you believe tarot can help with relationships? Yes, I know that it can. I think tarot may help to clarify our thoughts. It could be possible but I'm not convinced. No, of course not. Tarot is merely an amusement. Do you have a relationship question? Ask here and I'll draw one card for you. If you are new to tarot then it's a good idea not to read for others until you have more confidence. Don't get your cards out in company. Volcano, pop over to my website tarot-study.info. I'll do you a proper free reading there. I'm not sure if my comment posted? I want to know about a recent break up. I want know if will i get a new relationship this month? Jane, it's a little unethical of me to try and read someone else's feelings without their permission. It's called a 'third party reading'. However, I can draw a card for you to see what the tarot has to say about your relationship. I'm using the Robin Wood Tarot and your card is the Knight of Cups (so you can Google the image if you want). This card suggests that there is a new love for you around the corner, that your 'knight in shining armor' is on the way. In order for this to happen, you have to let go of the old relationship and open your heart to the new one. Good luck! I just want to know if my ex-bf is still inlove with me? Thanks for your question. I'm using the Every Day Witch Tarot and your card is the Hierophant. This card is about seeking guidance and advice. It's also about sharing your experience and feelings. Therefore, it tells you that rather than waiting for your bf to make a commitment, your future is something you should be discussing together. Commitment to each other is not like waiting for a Christmas gift to be bestowed upon you, it has to be a mutual choice. So talk to him, yes? Hi Pomegranat, I'm using the Everyday Witch Tarot and your card is the Ten of Wands (in case you want to do an image search for it). It shows a young woman struggling up a hill carrying a heavy burden of ten brooms. A cat clings to her shoulders. It looks to me as if you are trying too hard, instead of allowing things to progress. Perhaps your expectations are set too high, too early? Then instead of being a fun place to be, the relationship journey becomes your responsibility or your work-in-progress. Perhaps, like the cat, you are presenting an image of neediness. The cat could easily walk alongside his owner and lighten her load, instead he hinders her progress. And the relationship, still in its early to middling stages, has not yet developed strong enough foundations to deal with your expectations. You can break through this block by journaling: conversations with your partner, feelings you have, the vibes you pick up. If you do this every day, you'll begin to pick up patterns, which you can then adjust. Another thing that you can do is to find out how to fall in love with you. Once you do that, loving someone else, and being loved by them feels natural and easy. There is no more struggle. Where/What is the blockage that keeps me repeating certain situations in love? Hi Tonya, I've drawn the Hanged Man from the Everyday Witch Tarot. 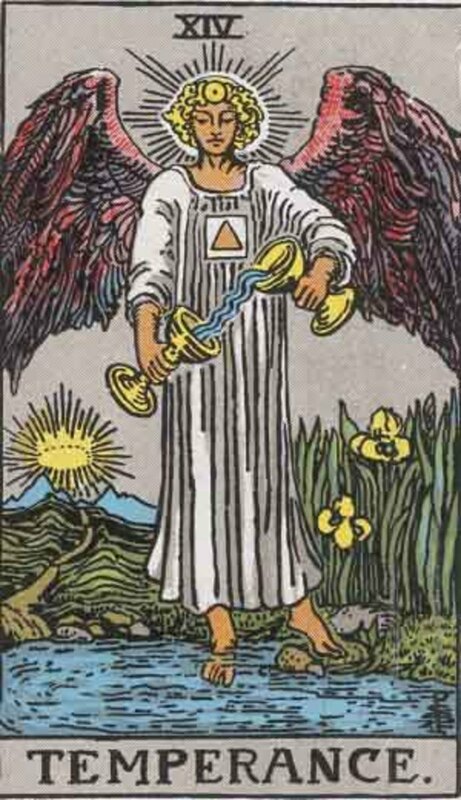 This card indicates that if you do not make changes, everything will remain the same. In other words, he's not going to change his behavior unless you change yours. 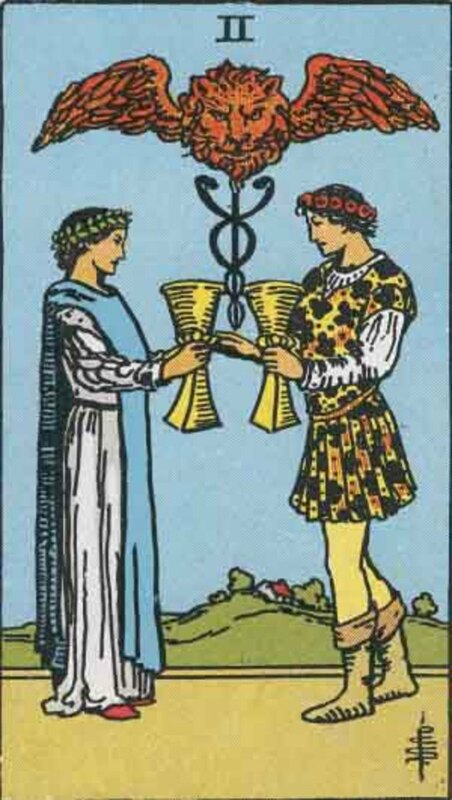 If you look for this card online, you'll notice that the hanging figure is holding the key to their padlocked wrists right there in their hand. They have the power to break free, but they are choosing not to. The hanging one's eyes are also closed as though they are not wanting to acknowledge the truth of their situation. What will you do? Hi Cynthia, too many questions for one card, I'm afraid. Using the Robin Wood, I've drawn the Devil. The Devil in this card is the best version ever. Look it up on Google image search. The Devil shows that you are shackled to the idea of having a soulmate. That he can't come to you because, for some reason, you are not free, or there is already too much going on in your life. Give up the idea that there is only one person for you. Let it go, and then perhaps Mr 99.99% will show up. Will I have a new love of my life? What's my soulmate look like? How would I know him? Hi pppp, your card from the New Vision Tarot is the Seven of Swords. There seemed to be a lot of dancing around each other in the relationship. As though you were fearful of actually saying how you felt -- this applies to both, not just you. When you parted, one of you lost something -- could mean trust or self-confidence. This card does not hint at a reunion, however, it tells you to salvage what lessons you can and use them to move on. Good luck. My question (if you don't mind :))would be, does my exboyfirend still love me and will we get back together again? Hi jimor, I have shuffled and drawn a card from an interesting deck called Tarot of the New Vision. Your card is the Seven of Cups which shows that you have many possibilities to choose from. It warns you that you are not the passive passenger in your life but the one who does the choosing. If your ex shows up then that doesn't mean you have to rekindle the relationship unless you decide to do so. The fortune-teller was right in some ways - it depends where your focus is. If you think a lot about the past then the past will keep repeating in cycles - think Groundhog Day. If you focus mainly on the future, then you are, like the Seven of Cups, living in a dream world. Your best bet is to focus on the now, where life is happening -- leave the future to unfold by itself. Good luck. Hi, I really liked your article, i was told by a fortune teller that my past returns, I was wondering if that's my ex, since I feel like there s somebody else I like instead? Your card is the Queen of Wands drawn from the Robin Wood Tarot. This 'personality' is warm and impulsive. She advises you to put your fear of the unknown behind you and embrace your new life. You have given yourself a chance to start over but you are scared about the future. Don't be. If you are meant to be with this person, then you will be, however, right now, you should focus on the next few steps *by yourself*. I have recently ended a relationship and don't know whether I have done the right thing. Is there any hope for us? Hi Lynn, thanks so much for reading this hub and for your very useful question. We tend to label cards as 'positive' or 'negative' because we are viewing them through the lens of our own experiences and preferences. In truth, all the cards are neutral. It's very helpful to us to have our personal viewpoint because it acts as a filter. The filter enables us to apply meaning to the cards/events/life-in-general. However, sometimes it helps to bypass our filters in order to see a different version of reality. So, to take your examples: the 7 of Swords is seen as negative because it is often illustrated with what appears to be a thief. You see him as a thief because 1. he looks like one 2. you are told this card can mean thievery. However, what if the person is retrieving something that belongs to him already? What if he is stealing something to help someone in dire need? What if it means that a woman is taking back the confidence that her partner beat out of her and leaving him? In regards to representing your higher self - it can mean that it is telling you to get out of a situation, to regain something you have put aside, to ask yourself if your actions align with your principles... you can think about the card and dig for the meaning that makes most sense for you. 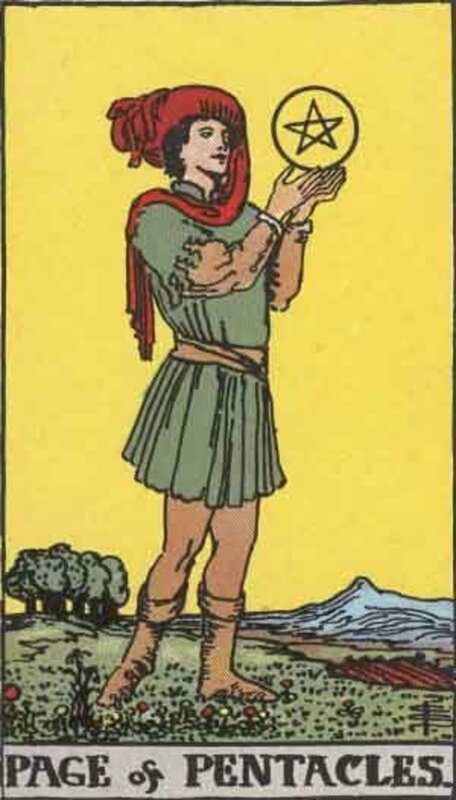 Five of Pentacles: we see poverty and desperation. Or perhaps we see a successful escape, reaching sanctuary, a challenge to be overcome or a required change of thinking (someone might see themselves as being in financial trouble, when really they need to count their blessings). The Devil is a brilliant card to appear for a higher self reading. It can mean the usual things: attachment, addiction, control, lack of control, self-inflicted whatever. OR it could mean a situation that you can leave behind, or maybe you need to relax and be a devil? Perhaps you are trying to fool yourself about something? Are you letting an outside influence control you? Are you putting ambition over other important issues? Again, you can dig around and find the most meaningful aspect of the card. Keep asking questions; what if it means this? Or that? Could it be...? If nothing occurs to you right away, put it to one side and do a little research. 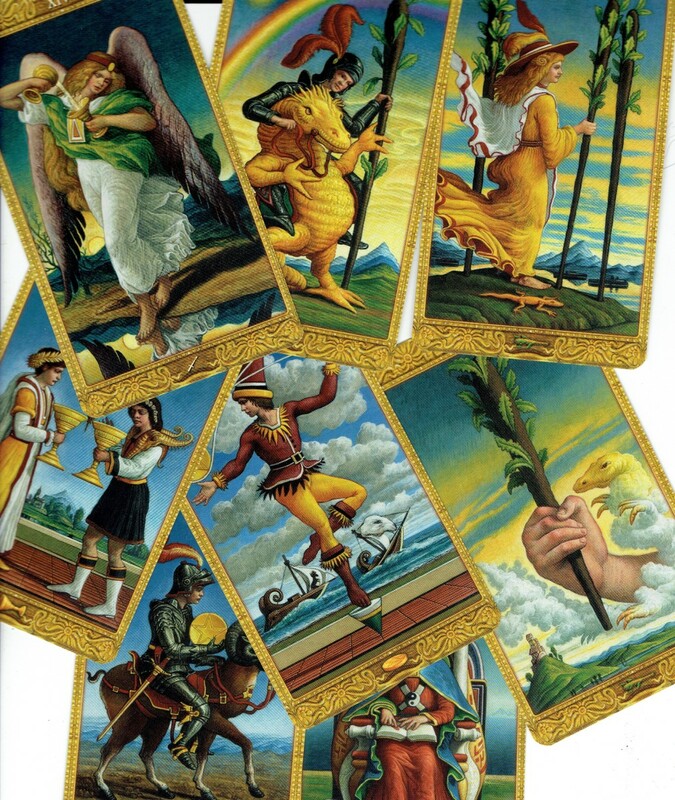 Keep in mind the inherent neutrality of every card and you'll get much more from the tarot. Good luck and thanks again. Thank you so much on sharing about 'Relationship With Yourself'. I lately went to see someone to help me with identifying my blocks and the outcome is that I do not love myself enough. I am always putting others first, and all my relationships failed because I have failed to love myself enough to expect more instead of simply picking someone because he fits a gap in my life. Your sharing will help me to continue to be more aware of creating a good relationship with myself before I can attract the right person into my life. My question is, if the card that I have picked for my higher self isn't a very positive one, e.g. 7 of swords or 5 of pentacles or devil or tower, then how do I go about doing the reading to align my current self with my higher self? Thanks for answering my query. Hi Michelle, so sorry to hear of your troubles. Your card is the Eight of Wands. This is a very focused card, indicating events moving quickly. It doesn't say yes or no to whether your marriage will continue, but it is a positive card that tells you that you are moving in the right direction for you. You said that you haven't handled the separation too well - well, who would? It's okay for you to be upset. It's a very difficult thing, especially if not welcomed by one partner. The Eight of Wands also represents organization; pulling things together; gaining clarity. It encourages you to take a step back and try to see the bigger picture. Maybe this has happened for a reason that you can't yet see? Perhaps the relationship wasn't ever going to work? Could it possibly be because there is something better up ahead? My advice to you is to try (I know, easier said than done) to be a little easier on yourself. To let things go. Use the word 'release' as your private mantra. When you feel tense, say 'release' slowly and let your breath out. It's really surprising how this little exercise can make you feel better. Once you get to the stage where you can say "It's okay whatever happens..." then things can begin to move forward. Good luck. Thanks, Judi. I just love to see how tarot can fit in with other viewpoints - from the down-to-earth sensible to the weirdly conceptual, and then integrate it all into something I can tell my clients without sending them woo-woo! It's not just the luck of the cards here, it's the luck of finding a reader with lots of common sense and good advice, which you seem to have in spades. Good read, very interesting! Thanks for your great comment, cynthggt. 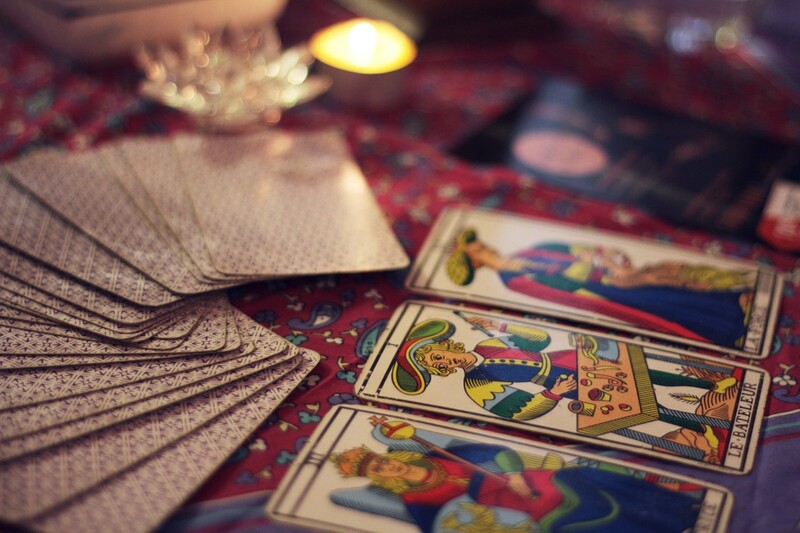 I think that leaving someone with a feeling of optimism is the one thing every tarot reader should do. For some people having their feelings confirmed and being told it will work out in the end (because nearly everything does) helps people to get through their struggles with faith. I once had a tarot reading from a psychic our company hired for our office Christmas party (very anti-Christian company). But for fun I went for a reading, and I was amazed. Without my saying a word he knew I was in the middle of a legal battle and told me I would prevail; and then added: "You're going to have a career." Now, I am still involved in that battle but I don't have a career, but that's not the point. His saying what he did helped me remain optimistic that the tables would turn for the good one day and justice would prevail. So, although although still a little skeptic, his reading gave me hope. I must add also that I believed him because he told me things about a relationship I had that no one could have possibly known. I thought when I approached him I was certain to be entertained by a lunatic of some kind. I do not think that way anymore - but I do stay away from them (ha ha). Your writing is very engaging and well written. I was glued to it until the end. Thanks for sharing.